We begin the Lenten Season this First Sunday by joining Jesus in the desert as he struggles against the “temptations” that could destroy the mission and ministry he is about to begin. There are prototypes here for all of the struggles in the desert that we too face. The readings for the day are beautiful in metaphor and meaning. They can be difficult to understand. They are not meant as literal historic or scientific happenings but are packed full of many essential meanings described in poetry, story, idiom, imagery and metaphor. In the Genesis reading and the Gospel, temptation is faced. But, it is far too easy to say they are aboutdealing with temptation. They are about choice and discerning and accepting God’s work, mission, for us in building the kin-dom, the reign of God’s presence here on earth. The Gospel (Matthew 4:1-11) is about Jesus and his wrestling with how he would announce and bring about the kin-dom. They are about what we do with God’s affirmation and how hard it is to enact and live the Gospel once we understand it. They are about our own deserts and accepting our callings. In the first reading, Genesis 2:7-9, 3:1-7 humanity is created by the very breath or spirit of God, and given all of creation to enjoy, work in and care for as well as the choice to do what is right or to choose the “wrong” path where evil is encountered. Wow! For me, this is a “selah” moment, a moment to pause and appreciate what God has done. Yet, with this gift of choice we can choose good or evil for all of our days. The Epistle, Romans 5:12-19, contrasts Christ, who discerned and enacted God’s love and justice even when it cost everything he had, and Adam who all too easily chose what he knew to be wrong (and then blamed it on Eve who blamed it on the poor serpent). From Adam, in being human, we inherit a propensity for good and for evil, for sometimes making death- dealing instead of life giving choices while from Jesus we learn what life giving choices are and gain life now and forever. Wow! Another “selah” moment, to pause and appreciate what God has done through Christ. The Gospel story according to the writer of Matthew takes place right after Jesus’ baptism where Jesus experiences God’s loving affirmation in a way that is beyond words to tell. Jesus knows that he is chosen, affirmed and deeply loved by God. (Matt 3:17). “Then he was led by the Spirit into the desert to be tempted…” (Matt 4:1). In the Hebrew and Aramaic Scriptures imagery and metaphor are dramatically used (Errico, Let There Be Light). The phrase “led by the Spirit” usually means “had a dream or vision”. In Aramaic the word “tempted” means to be tried out, much like a new horse would be tried out. So Jesus is trying out his mission as the one who is chosen and, in essence, discerning what it will be and how he will enact it. The imagery of the desert is appropriate for such discernment. I have been in the remaining desert area in Israel and it is endless sand, hills of sand and endless valleys and surfaces of sand. There would be no temples or parapets to jump off of and certainly there would be nothing to eat-not even the cacti that exist in the American deserts. The word “devil” or “satan” in Aramaic is “deceiver” or “to lead astray” and it does not mean a supernatural being or force. Jesus prayed, reflected, wrestled and dreamed and wrestled again with deceptive notions of who he was and could be, of power and of mission. In this trying period of discernment (the idiom 40 days is used much in the scriptures and means a period of trials) Jesus turned his back on doing tricks like turning stones into bread instead of the very hard work of ministering to the poor, the sick and the outcast in need of healing and inclusion. He also turned his back on religious power-he would not become the head of the established religion but he would question, clarify, and challenge what had become of the Law’s intent and the covenant between God and God’s people. When necessary he would take on the establishment and they would respond with a vengeance. Similarly Jesus turned away from the appeal of becoming a political leader with “all the kingdoms” at his feet. The reign of God was not a material or political reign as much as some wanted this. Jesus would show us what the reign of God could be. It would cost him his life. Jesus agonized and clarified what he was about and what his ministry and mission would be. In essence, in the desert experience Jesus agonized over accepting the cup long before he prayed tears like blood in the Garden of Gethsemane after the last supper. The poor and outcast would welcome him and love him, but we all know the end of the story. Jesus had to know that, unlike the tempting paths of personal, religious and political power, what he was about to do using the power and authority to change human lives would cost him everything. But he was ultimately not tempted to abort the mission God had given him. He would show us how to love, and enact inclusion and justice, no matter what it cost. When Jesus finished this trying period of discernment in the desert, he began his ministry. He preached “turn your lives back to God”. In Luke he defined his mission as “preaching the good news to the poor….” He healed the sick, welcomed the stranger, included women and foreigners and showed us how to live the Good News. Through him we are all grafted into the tree of life and we are asked to follow him,to DO what he did. I think that all of us who want to follow Jesus have agonized at some time over this calling. I know I have. Each and every one of us who wants to follow Christ has a unique gift to give different from the others. But the common ground is putting those gifts at the service of God’s people and building the kin-dom. 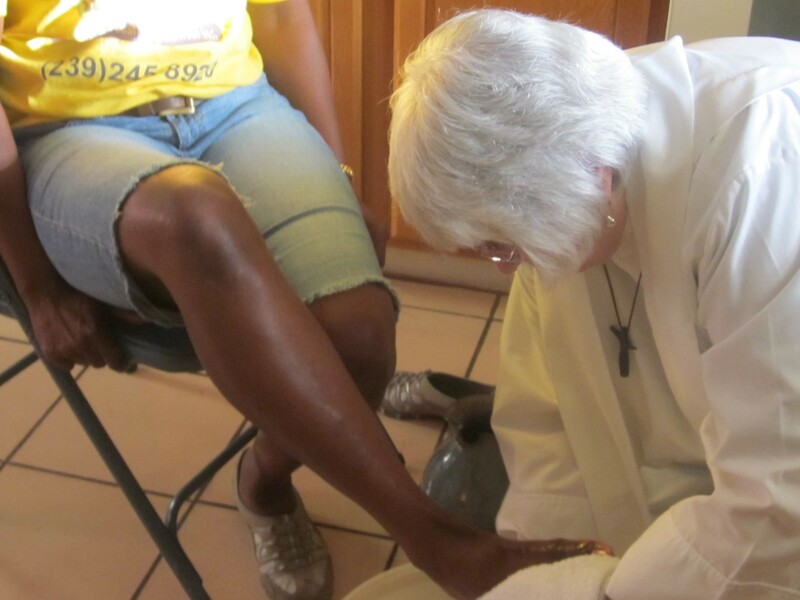 I have served God’s people most of my life using my experiences and my training as a clinical social worker and teacher of social workers and pastors who wanted to serve and counsel the poor, the homeless, the outcast and those who faced the demons of mental illness, addictions and many aspects of physical and spiritual dying. Yet in the helping professions and in one’s every- day life one can legitimately take time off and time out. One can always take vacations and rest from this work or change jobs. But when one does it pastorally and sacramentally another level of self- giving is involved. Like Jesus, all is given. Yes, Jesus wants us to go aside and rest for a while or we will truly burn out like falling stars. But we are the face of Christ to the world and only the grace of God enables that face to be smiling when we too are tired and overwhelmed at the constant need and the unending nature of injustice and pain before us. My particular call is to be a priest and pastor of the poor. I became a priest not to wear robes and serve at a high altar, but to serve at the altar of broken lives, especially those broken by poverty and oppression in addition to life’s other blows. I wanted to open up the alabaster jars of sacraments and make them available to all. (Susan Ross elaborates on this task in her book Extravagant Affections: A Feminist Sacramental Theology). I can never turn my back on this call and instead sometimes have to turn my back on the kinds of things Jesus was tempted with: human hungers, magic powers, and power in institutions religious or otherwise. I knew a little of how hard all of this is when I accepted ordination, but almost six years later I know it isonly by God’s grace, and not one’s own powers, that one can do it at all. Thank God for this grace. Love will heal it all”. You gotta take the cup. After much trying discernment I did joyfully and willingly take the cup. I renew that vow every Sunday when I finish the cup. I love my people, our ministry and my life. But I know a little of what Jesus did in the desert. And so do you. May God guide you and love you in your desert times. 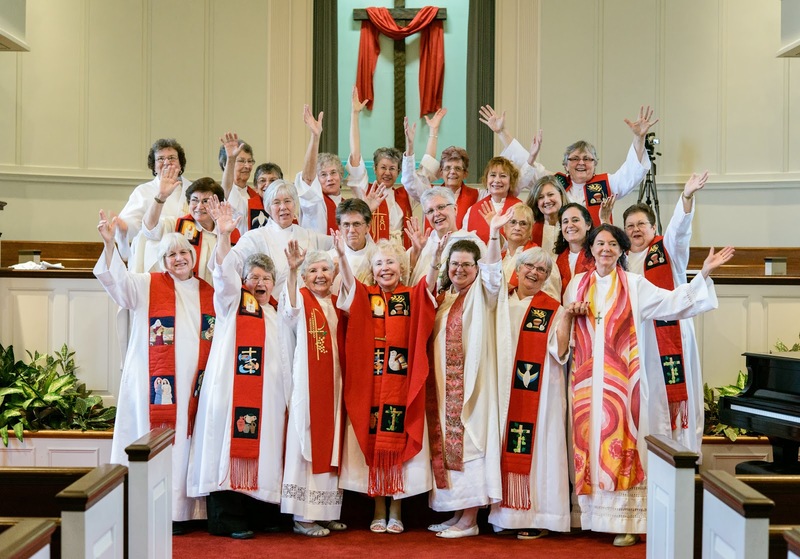 Happy International Women's Day from the Association of Roman Catholic Women Priests: Gospel Equality is our Passion! Advocate for women priests Roy Bourgeois, with Victoria Rue. and RCWP, Janice Sevre-Duszynska, ARCWP who co-presided at an inclusive , women priests-led liturgy at Conference. 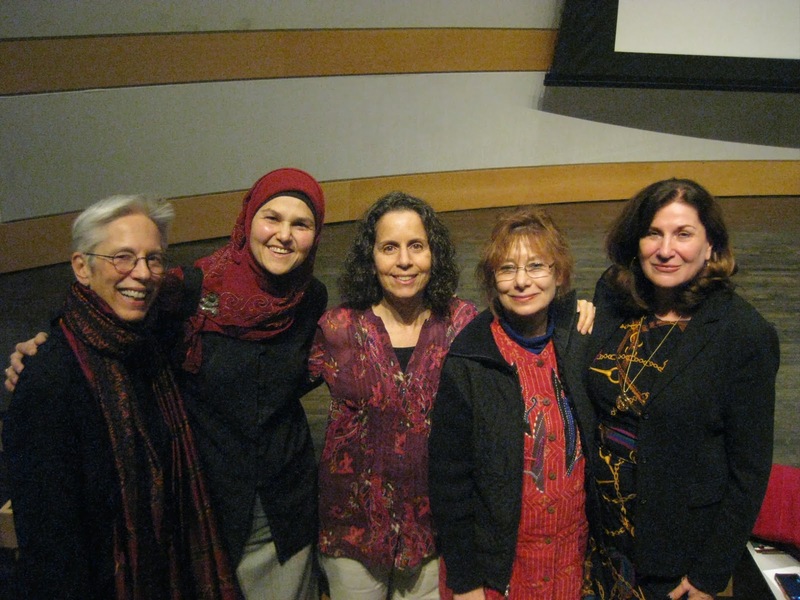 Left to right: Victoria Rue, RCWP, Maysa Kergaye, Coordinator of the Islamic Speakers Bureau;Christine Gringeri, University of Utah, Janice Sevre-Duszaynska, ARCWP,Margaret Toscano, Ph.D, Associate Professor of Languages and Literature at UU, who moderated the panel discussion. We Will Sing and Not Be Silent” was the title of the event on Women, Faith Traditions, and Leadership” held on Saturday, March 1, 2014 in Salt Lake City Utah. The symposium was sponsored by the University of Utah College of Social Work under the auspices of Christina Gringeri who has interviewed Roman Catholic Women Priests as part of a research project on our movement. The College of Humanities and the following departmental programs and others also provided funding for the event: International Studies, Religious Studies, and Languages and Literature. RCWP priest and longtime friend, Victoria Rue of Oakland, and I began the day leading a morning liturgy at Jane’s House, an elegant mansion in SLC. People of all faiths gathered with us to celebrate the first Eucharist in Salt Lake City led by Roman Catholic Women Priests. 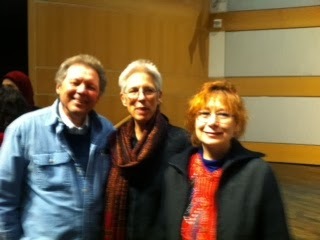 Along with us were feminist theologian Rosemary Radford Ruether and Roy Bourgeois who were housed with Victoria and me in Jane’s house as they were also invited to speak. That afternoon we gathered at the Main Library Auditorium, which was part of an eclectic glass structure filled with activities, shops and stores. The event, which was free and open to the public, was well attended. and Victoria Rue, M.Div., Ph.D., Roman Catholic Womenpriests. A screening of “Pink Smoke Over the Vatican” followed. Fr. Roy Bourgeois and I answered questions from participants. Our sharing of women’s struggle for justice in our faith traditions offered insight and inspiration for all gathered, young and old. Because of the storms my flight was delayed until Tuesday morning. On Sunday I was invited to visit the Mormon Temple with Tara Romney Barber, Christina’s research assistant, and walk thru Canyon Creek with Christina. On Monday we drove through the mountains and visited the Cathedral of the Madeleine, the only cathedral in the U.S. dedicated to St. Mary Magdalene. What an exquisite structure! Neo-Romanesque on the outside, it reminded me of churches I’ve visited in the U.S. and Europe. 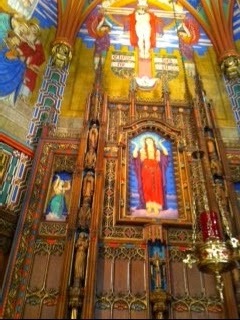 The inside was glorious especially the background painting behind the altar and the mural of Mary Magdalene at the tomb. 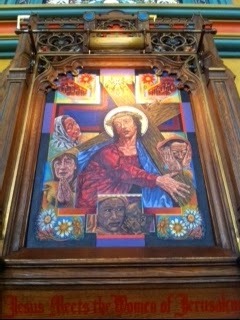 The Stations of the Cross are extraordinary and not to be missed. 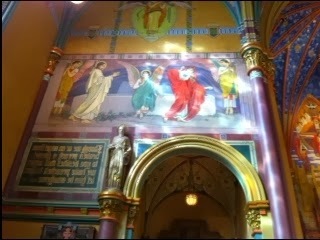 They were painted in 1992- 3 by Sam Wilson, who was inspired by European painters, especially the Italian. Besides evoking the passion of the cross, each station presents animal, plant and religious symbols that provoke thought and make the experience even richer. For me the cathedral evoked native -American colors like one finds in maize, the multicolored corn used for Autumn decorations, full of the Earth’s glory and delight. My photos are in article but check out the following link compiled by the painter himself. It is a tragedy that Medea Benjamin suffered such a brutal attack and that thousands of women endure this kind of treatment in our world today. Let us remember that God is always on the side of justice and peace, mutual respect and compassion, and do all we can to be ambassadors for Divine love in our world. We can pray, express solidarity and let our government know that we support peace and justice, and the human rights of all people. We are all members of the family of God and deserve to be treated with respect. 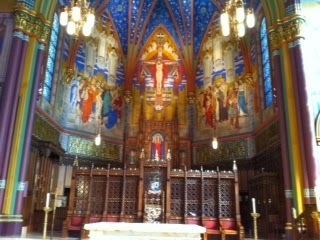 Liturgy on Sat. 4 PM at St. Andrew UCC at 6908 Beneva Rd. Sarasota, Florida. Our community had two worship services today, actually one service and one Mass. 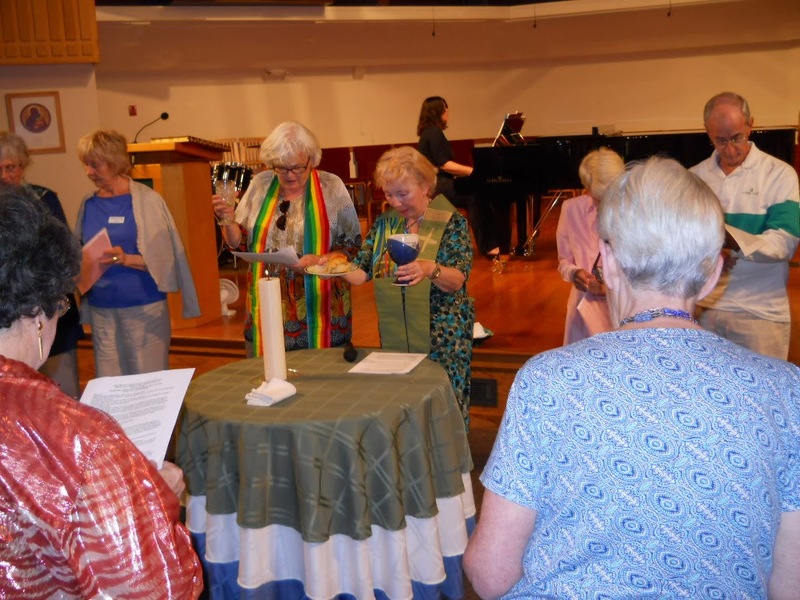 The Mass was after the first service and attended by twenty-one people including families and the ashes were given after the homily followed by the Eucharist where Pastor Judy Beaumont presided and all consecrated and prayed the liturgy together. After my part of the homily the people add their own insights. The raw sharing of what needed to be changed in lives followed. Anger at family members, hurt, resentment, selfishness and having no time for God or others needed to be changed during this Lenten season. One elder praised the young people who were there for coming and told them to hold their heads up high at school with the joy that they followed Christ. I was deeply moved and blessed everyone there for their faithfulness in starting this Lenten journey together as a community and in the quality of care that is so evident among them. All present received ashes and participated in sharing and being the body of Christ. 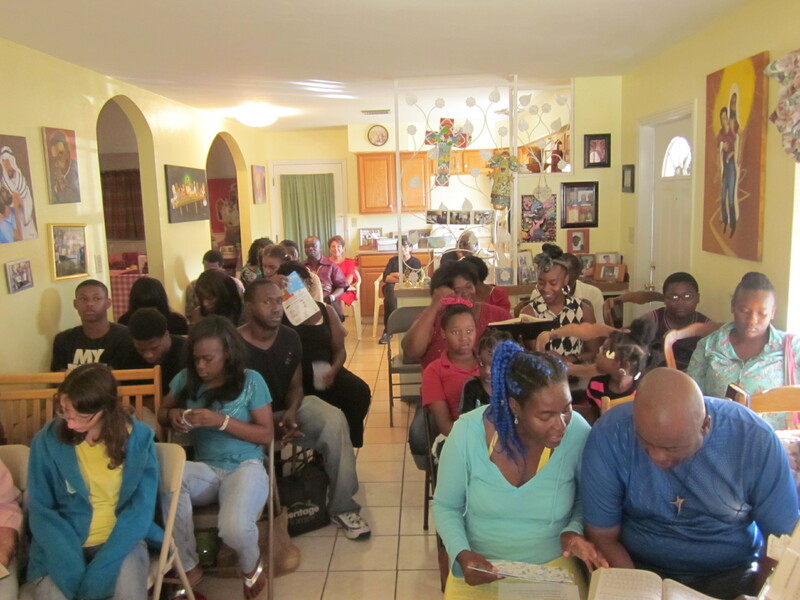 The first service was attended by eighteen people most of whom were formerly homeless. I will share the sermon that emerged from this gathering of God’s people. The first thing we give on this day is hugs-hugs in response to their generous hugs and hugs requested by them. By the time the service begins all are feeling loved and welcomed. This, our usual Tuesday group, is a faithful and enthusiastic group that enjoy the informality and freedom of participating in the discussion of the day’s scriptures, in prayer and in sharing their own stories. They look forward to the hot lunch but often let it get cold as they become involved in discussion and prayer. They remain long afterward to enjoy the company of one another in their church living room. Usually a few “new” people also attend. Today we had two new men join our circle. In between the two services I saw people in counselling and referrals and Pastor Judy B. saw them for concrete needs. The mood is joyful and the talking and singing can be loud as feelings are expressed in tone and tempo. Even the solemnity of Ash Wednesday could not temper the joy at being together once again. This group knows suffering-the suffering of sleeping in the street or woods, the suffering of being hungry, the suffering of physical and mental illnesses that go untreated, the suffering of rejection and shunning, of people not seeing or looking away, and the suffering of losing family and friends to violence, to illness, to neglect. Mortality awareness is every day. There is no need to remember it as if it is far away. A few also struggle with life consuming addictions or mental illnesses. Evil touches their lives on both personal and social levels as the poor here in mostly right wing Florida have very little given to alleviate poverty and suffering. So when I explain the themes of Ash Wednesday and why we keep this ritual of the church for those that may not know there is immediate understanding. The ashes are a sign of our turning around, of sorrow for those things that absorb us and keep us from right relationship with God and one another. The ashes are also a sign that we were made from dust and will return to dust. I add that the dust could be stardust or earth dust but we are created by our loving God in God’s own way and we return to God when our days are done. A few laugh heartily at the idea of stardust, seeing it inferior to good old mother earth dust and clay, seeing it as a truly far away metaphor, not needing any scientific explanation to satisfy their longing for a God who loves them and accepts them as they are. The God who is Love is very near to them-no metaphors are needed, euphemistic, ethereal or otherwise. Lauretta said “I didn’t think I needed God until God was all I had. When no one else loved me, I knew God still loved me.” She and Roger and Nate and Gary add that our ministry brought this love to them and now they make it their business to bring it to others. I said that as I look around the room I see a room full of people caring for one another and that is what God asks of us as we follow Jesus to the events of Holy Week and Easter, as we live the Gospel, the Good News, with Jesus. Phyllis, Dwayne and Mary laughed when we made the distinction between “giving up something” and giving our whole hearts to God reflecting on Joel 12: 12-18. “No, God don’t want your bubble gum, or your cake, God wants your HEART! God ain’t no fool, and you can’t fool God!” Phyllis emphasized that everybody was to be brought to God, even the babies and that’s something-the whole community needs to realize who God is and how we turn away from God to satisfy our selves alone. John repeated that it is God’s love that we turn away from and yet God welcomes us back. After the Epistle reading (2 Cor 5:20-6:2) there was a veritable chorus of “NOW is the acceptable time” to be reconciled to God. Then we sang “Holy Ground” touching our hearts and pointing first to ourselves and then to our neighbors as holy ground before the reading of the Gospel. After the reading of the Gospel we discussed acts of charity and fasting and praying. Dwayne summed up: everything we do needs to be done for love. “Fasting” just means don’t pig out, don’t live to eat or drink or do anything, live to love God and each other. People discussed where they pray and how they pray. Our volunteer cook of the day, Gini, prays as she walks and hears the birds and breathes God’s good air with the sun on her back. Lauretta prays by listening because otherwise she talks too much. Gary prays in his room where he is not distracted by anything. Nate prays as he rides his bike. Phyllis then made the Gospel reading ((Matthew 6:1-6, 16-18) come alive. She began to smile and then laugh. She said that she just “got it” Jesus was really making jokes about the hypocrites who blew their horns to herald their own righteous actions. She put those verses in her own words as Jesus might have said them with acting out the horn blowing, standing on the street corner, and making long faces and we were all laughing. We then said Jesus’ prayer together holding hands and I blessed the ashes. I explained that there were two things that I could say as I made the sign of the cross on their heads with the ashes: the “dust to dust” saying or “Turn away from sin and be faithful to the Gospel”. The group was of one accord that the second one was the meaning they appreciated. Phyllis said, “ They say the other when they put you in the ground -when it is a funeral”. All agreed. I said I agreed and said that I intended to say the second-we are being invited to live, not to die. We need to reconcile with God who loves us completely and wants life for us. We need to help each other to walk the walk. All agreed and each one smiled as they received the ashes that reminded them of God’s love and desire for us to live fully now and forever. How wise the people are, how easily they cut through to the essence of God’s love. I hope that you enjoy their sermon(s) as much as I did. And I hope that you will use this Lenten season to reflect on the ways you connect, disconnect and reconnect to our loving God and service to God’s people. Will Pope Francis Finish Martin Luther's Reformation? energy to do it the right way. carried water for the poor, rebuilt the devastated homes of the poor. clearly. And all the while she was telling me this, she was smiling. sees it as the next way she'll be in God. depths of one's spirit can it be told what a person is really doing. a load of food and clothes? reign of God, here and now. "Women’s role in the Church should be rethought and integrated into the Pope’s ideas for greater synodal dynamism and a missionary conversion”: women should be offered leadership roles within the pontifical councils and in the future Congregation for the Laity given how many bishops the Curia has. Temporary mandates should be introduced in the Curia to prevent careerism, calling priests who already have some pastoral experience. This was the crux of what Cardinal Walter Kasper said in a long interview with Stefania Falasca published in today’s issue of Italian Catholic newspaper Avvenire. The German cardinal who gave the opening speech at the recent Consistory on the family went on to say the following: “I think that women need to be present at every level and even given positions of full responsibility. The intuition which the female mind has to offer is a vital resource. A Church without women is a mutilated Church. There are so many of them actively involved in Church bodies. Can we imagine community, charity and cultural centres today with no women? Without them, parishes would close down tomorrow. Women are already ahead and out there in a Church like Francis’ that is “going out”. Pope Francis has “openly acknowledged” the problem that exists, but he has not yet put forward “any practical solutions”, said Mrs McAleese, who was a professor of law at Trinity College and who has been studying canon law in Dublin and Rome...."
"Pope Francis is winning hearts and minds around the world for his emphasis on mercy, personal simplicity and vision for a church that is “bruised, hurting and dirty because it has been out on the streets.” He rejects culture-war Christianity and aloof moralizing from the safety of the sanctuary. He warns that a fixation on “small-minded rules” can stand in the way of ministering to those on the margins. A look at at a few recent headlines shows that some Catholic leaders never got the memo from Pope Francis or tossed it in the trash. A patient who suffered a heart attack at a Washington hospital recently told the Washington Post that a Catholic chaplain denied him last rites because he was gay. Earlier this year, a Catholic middle school in Montana fired an unmarried teacher after she became pregnant. The superintendent of Catholic schools for the diocese defended the decision with a cold legalism that would have made those letter-of-the-law Pharisees Jesus called to task proud. "If the Christian is a restorationist, a legalist, if he wants everything clear and safe, then he will find nothing…Those who today always look for disciplinarian solutions, those who long for an exaggerated doctrinal ‘security,’ those who stubbornly try to recover a past that no longer exists­ —they have a static and inward-directed view of things. In this way, faith becomes an ideology among other ideologies..."